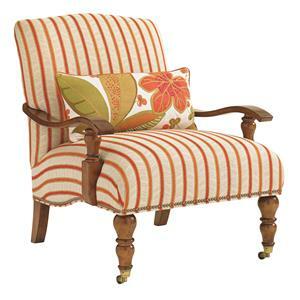 Create an island oasis in your living room or family room with this exceptional armchair. Design features include rolled arms with elegantly curled fern wood accents, traditional turned legs and wooden base rail. This graceful accent will create a casual appeal with tropical accents for your décor. One 18 x 18 inch blend down throw pillow provides visual contrast and comfort. Settle into the ultra down seat cushion after a long day working or playing in the sun and relax in luxurious style! The Bali Hai Quickship Shoreline Chair with Fern Leaf Carvings by Tommy Bahama Home at Hudson's Furniture in the Tampa, St Petersburg, Orlando, Ormond Beach & Sarasota Florida area. Product availability may vary. Contact us for the most current availability on this product. 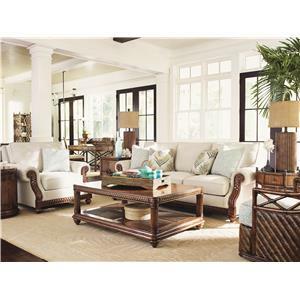 The Bali Hai collection is a great option if you are looking for Traditional Tropical furniture in the Tampa, St Petersburg, Orlando, Ormond Beach & Sarasota Florida area.